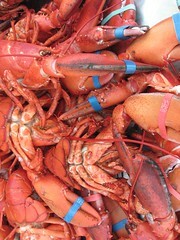 Pile of lobsters, cooked and waiting to be eaten. Photo taken at Woodman's of Essex, MA. The restaurant is famous for inventing the fried clam, a yummy treat! Hope you enjoy this feast for the eyes. I love the blue bands on the red lobster! Woodmans is also famous for inventing the way to embelish the price of a fried clam lol. Great shot of such a fun day!